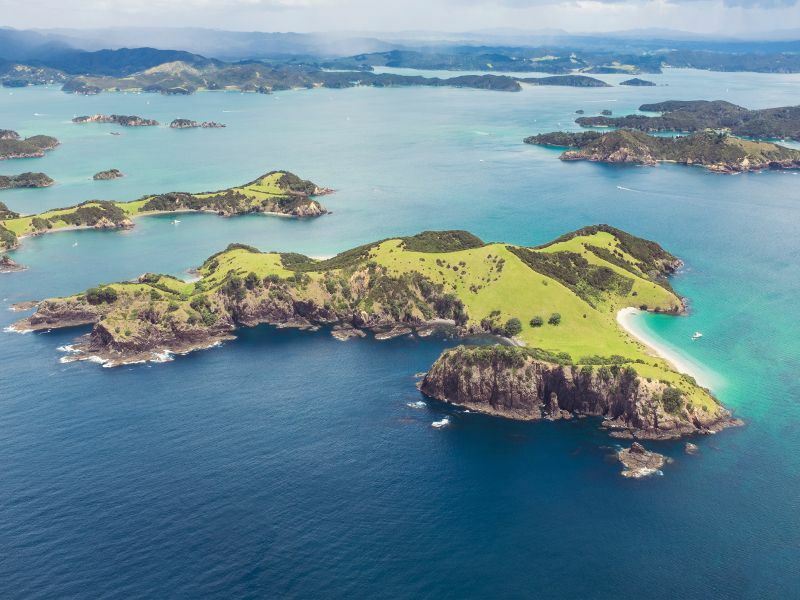 The Bay of Islands is where New Zealand’s story begins. It was here that the earliest Maori settlers arrived in their migratory canoes some 700 years ago. Captain James Cook was the first European to land, in 1769, staying long enough to give the region its name. Whalers followed in his wake, then afterwards came waves of missionaries. The Treaty of Waitangi, the nation’s founding document, was signed here in 1840, establishing New Zealand as a British colony. And today, still bearing many traces of these momentous events, the Bay of Islands is one of the country’s most popular visitor destinations, renowned for its breathtaking natural beauty, delectable seafood cuisine and living heritage. 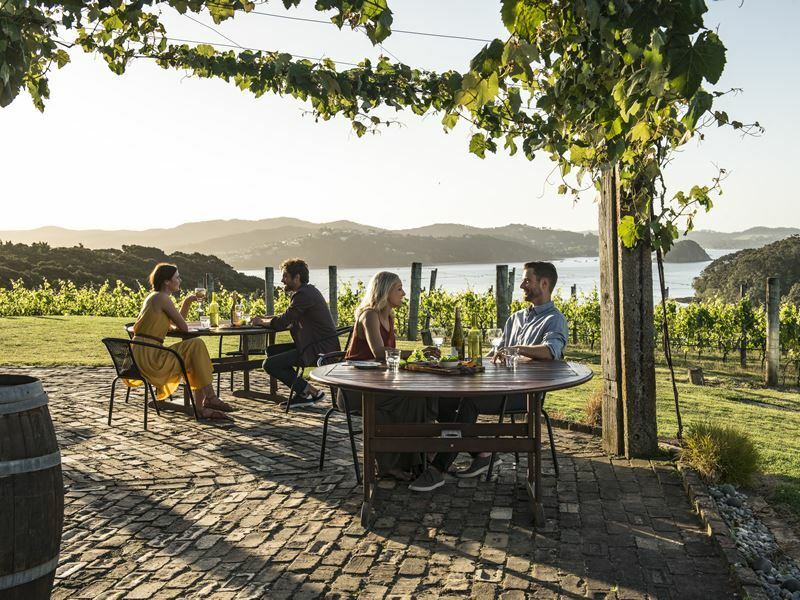 Known as ‘the Winterless North’ on account of a wonderfully mild climate that has allowed its vineyards to flourish, the Bay of Islands is in Northland, situated on the east coast at the very tip of the North Island. The nearest city, Whangarei, is around 40 miles to the south, while Auckland, is a three-hour drive, or a half-hour flight from the town of KeriKeri. The bay itself is 10 miles wide and contains 144 islands, many of which can be explored by boat. With several scenic inlets and a notoriously beautiful coastline, as well as what’s reckoned to be the second-bluest sky in the world after Rio de Janeiro, the Bay of Islands is a mecca for watersports enthusiasts and beachbums alike. For those prepared to make the journey up, it’s often a highlight of their New Zealand holiday. The cultural hub of the Bay of Islands, Kerikeri is surrounded with fragrant orchards, vineyards and art galleries. The area was once home to a fearsome Maori chief, who nevertheless took kindly to the Christian missionaries and allowed them to establish their Mission House here, which is now the oldest surviving building in New Zealand. A short drive from Kerikeri, this relaxed and picturesque beach resort offers spectacular views of the Pacific from its golden sands, so it’s no surprise that many surfers, divers and golfers choose to base themselves. The most central town in the region, Kaikohe is fantastic for exploring the interior of the Bay of Islands, particularly by mountain bike along the Twin Coast Cycle Trail that takes you through some truly stunning bush landscape. This area is home to New Zealand’s largest Maori tribe, the Ngapuhi, and is where you’ll find such attractions as the Pioneer Village, a faithful recreation of a 19th century Northland settlement and the Ngawha hot springs. Not to be confused with Kerikeri, this small town is regarded as the gateway to the Bay of Islands when arriving by road. Here you can see probably the most unique roadside attraction in the country, the famous Hundertwasser toilets. The only building designed by the prestigious Austrian artist Friedensreich Hundertwasser in the Southern hemisphere, they were once voted the world’s best public conveniences - a memorable place to spend a penny. There is also a glow worm cave just outside town that doesn’t quite rival that of Waitomo further south, but is still worth a visit. This attractive seaside town is the main departure point for sailing and fishing trips in the Bay of Islands, with a large marina that is often the first port of call for overseas yachts arriving in New Zealand. Probably your best bet for exploring the Bay of Islands, at least by water, Paihia is the principal tourist hub in the region. It has a busy town centre, plenty of good cafes, restaurants and bars, and a wide roster of watersports, fishing and sailing activities on offer. Given the laidback pace of life in this charming little town it may come as a surprise to learn that back in the 19th century it was known as ‘the hell hole of the Pacific’, due to its lawless nature. Now there is a distinctly romantic atmosphere to Russell, its streets lined with cafes and gift shops selling touristy trinkets. 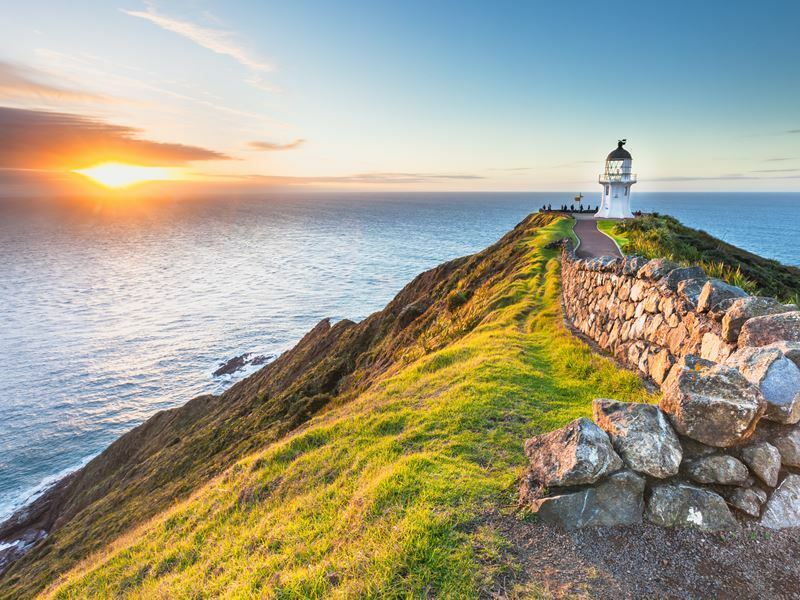 You can climb to the summit of Flagstaff Hill for fabulous 360-degree panoramas of the bay, and visit several historic buildings including Pompallier House and Christ Church, New Zealand’s oldest church. If you fancy a spot of day-tripping, regular ferry services to Opua and Paihia depart daily from Russell. Parasailing, kayaking, scuba diving, snorkeling, paddleboarding, surfing, jet skiing and banana boating - the list of watersports available in the Bay of Islands is almost endless. 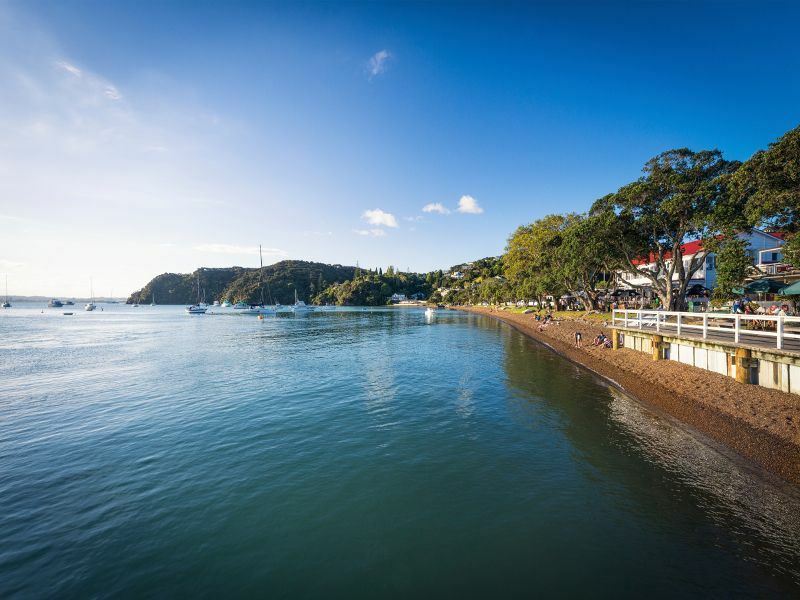 While most of the coastal towns have facilities, if you want to get wet and wild, the best place to head for is probably Paihia. In 1985, the Rainbow Warrior, flagship of the Greenpeace fleet, was sunk by French saboteurs, causing an international scandal. In the aftermath, the ship was towed north and scuttled off Matauri Bay, in sight of the Cavalli Islands. The wreck is now a popular Bay of Islands dive site, along with the HMNZS Canterbury. 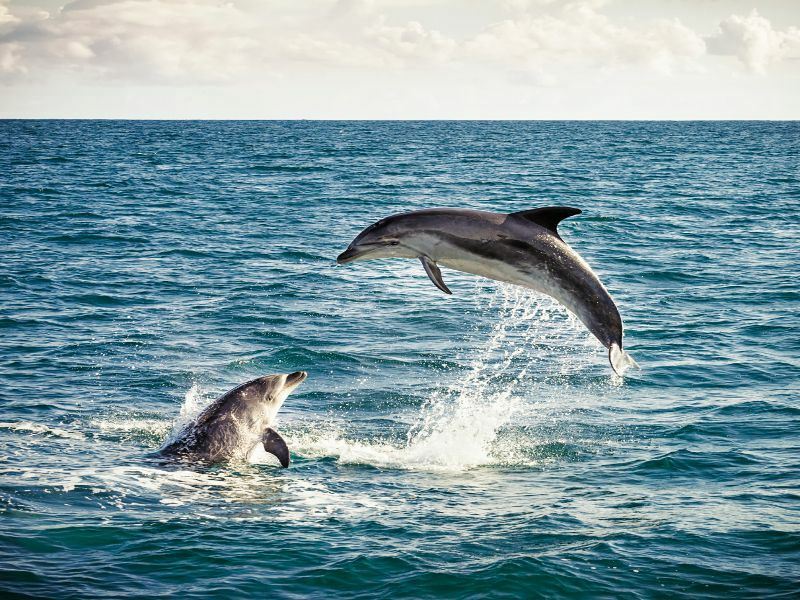 These sheltered waters are full of colourful marine life, from curious dolphin and fur seal to stingray and kingfish. Boat trips around the bay are among the most popular activities here. Several islands, such as Urupukapuka, Roberton Island, Waewaetorea and Motukiekie have walking trails on them. 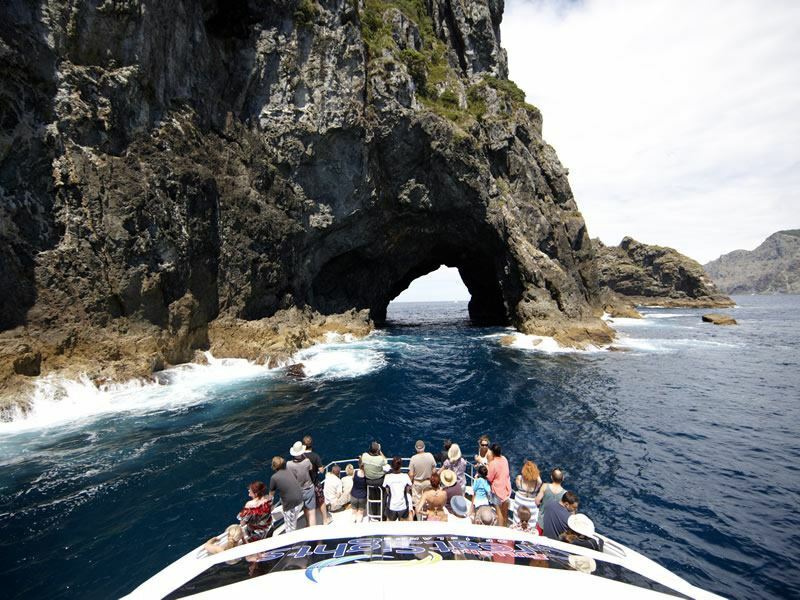 You can travel by yacht, speedboat or stylish catamaran, and many itineraries take in Piercy Island, where the iconic ‘Hole in the rock’ is one of the most photographed locations in the area. If you want a sailing trip with a bit of history attached, book passage on the Cream Trip as it follows the original route of Ernest Fuller’s cream delivery, which began in the 1930's. The boat still drops off essential supplies and mail to residents in remote locations around the bay, and just to put the cherry on top of this treat, you can take an adrenaline-charged ride through the surf, hanging on to the boom netting at the back of the boat. Of course it’s not all about the water. There’s plenty to do on dry land in the Bay of Islands and for many visitors, it involves making good use of the region’s myriad walking trails. 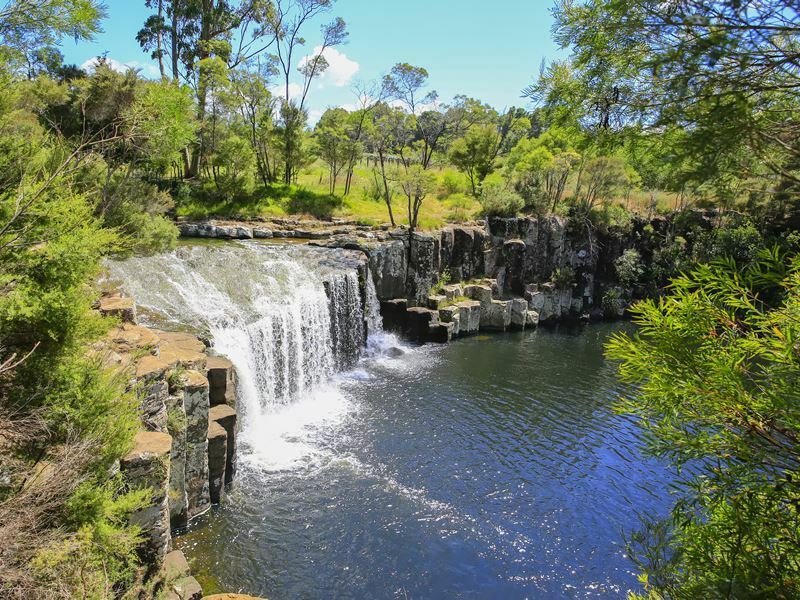 There is a wealth of coastal and forest routes to choose from, such as treks to see the Rainbow or Haruru Waterfalls, or out to Tapeka Point north of Russell, where on a good day you might see bottle nose dolphin, penguin, whale and many species of birdlife. 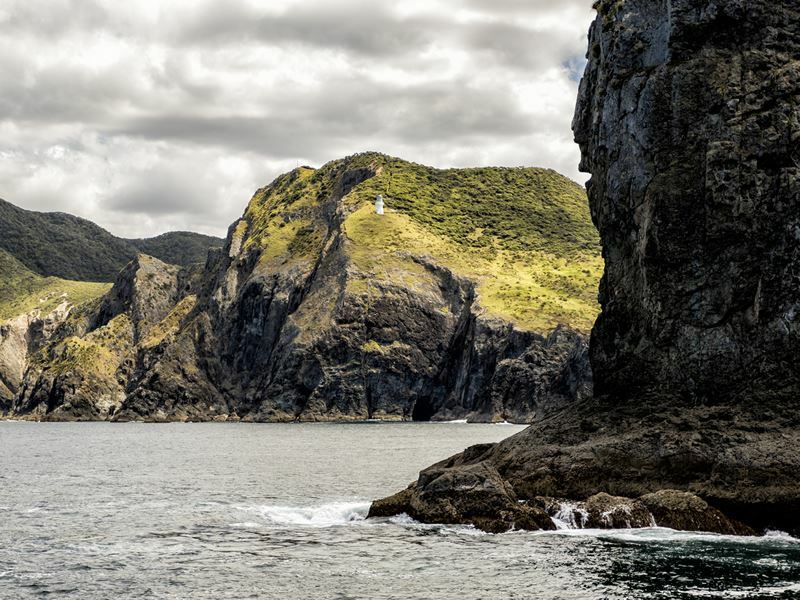 The Cape Brett walkway is one of the most popular hiking routes in the Bay of Islands. It’s an overnight trek involving a stay in a Department of Conservation hut, which needs to be booked in advance. The Wairere Boulders Nature Park near Horeke is another point of interest that’s great for adventurous explorers, a section of valley filled with hundreds of immense basalt boulders. Much of New Zealand’s earliest history can be traced back to Waitangi. The Treaty of Waitangi was signed in the grounds of a house owned by the British Resident at the time, James Busby. Now known as Treaty House, the building is one of the country’s most significant historic sites. You can also see a ceremonial Maori war canoe here, and the remarkable carved meeting house that represents the unity of the Maori peoples across New Zealand. There’s also a superb golf course nearby, that gives some magnificent coastal views. The Tasman Sea meets the Pacific in a surging mix of currents at Cape Reinga, a sacred Maori location and practically the most northerly point of the country - certainly you can’t get any further by road. You can see the ancient pohutukawa tree, from which it is said that the spirits of deceased Maori leap into the ocean as they return to their Polynesian homeland. From Cape Reinga, stretching down almost as far as the town of Kaitaia, 90 Mile Beach (actually only 55 miles long but who’s counting?) is lined with sand dunes that are ideal for bodyboarding. While Hawke’s Bay and Marlborough usually hog most of the attention for New Zealand wines, it was in the Bay of Islands that the first vines were planted by missionaries with a taste for the finer things in life. Many varieties of grape, including Merlot, Syrah, Pinot Gris and Chardonnay, respond well to the subtropical climate here, and there is no shortage of cellar door tours that will fill you in on the region’s thriving viniculture. In the Bay of Islands you’re never far from a restaurant serving seafood fresh off the boat - oysters and mussels are particular specialities. Other treats to be found here include a wide range of tropical fruits, and locally made cheeses. There are regular farmers’ markets held in towns around the bay where you can pick up delicacies, and if you’re visiting in October, don’t miss It! - Paihia’s most celebrated boutique food festival. Kauri trees grow for hundreds of years, but many forests have been devastated over the centuries by Maoris and European settlers who appreciated the strength of kauri timber when building their boats, and desired its gum for handicrafts such as jewellery. 25 minutes from Paihia, the Puketi Kauri Rainforest is a well-preserved section of woodland where you can take a harmonious walk through a perfect example of New Zealand’s ancient natural splendour.